Great tour. So much information and context, and you really get a feel for what it was like in that time period, in a way I didn't get anywhere else. Powerful. And while it's not intentionally scary at all, it might still be a little too scary for some kids. Great tour! Our guide was very informative and gave a lot of history about the time period. To be seen. The guide should speak slower for non english speakers. Very interesting tour and a great guide! A genuine insight to long ago. Guide was very good. 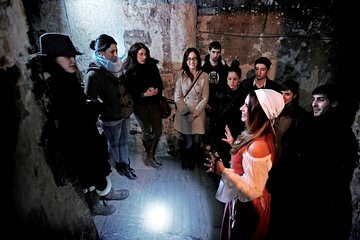 A very interesting trip and an eye opener as to how life was in Edinburgh in the 1500s . Good visual and sound effects excellent guide with a humorous approach to the story telling . An experience not to be missed when in Edinburgh. This tour was fun, and a great introduction to the history and architecture of Edinburgh. Tour guides were very knowledgeable and made sure we remained safe during an ice storm, while we were traversing the narrow passageways and steps. Their concern for us and their patience as we slowly made our way through was greatly appreciated. I recommended this tour to other Americans we met in the local pubs! Well done. Seeing this area is definitely worth it if you enjoy history - it is like stepping back in time. I am not much for theatrics though and I found it a little 'kitchy. There was a large family that made up about 2/3 of the people on the tour and they were obnoxious. They would not stop loudly talking over the guide and insisted on constantly standing together so they blocked the view of other people. I kept waiting for the guide to ask them to be courteous to the rest of the group but she never did.